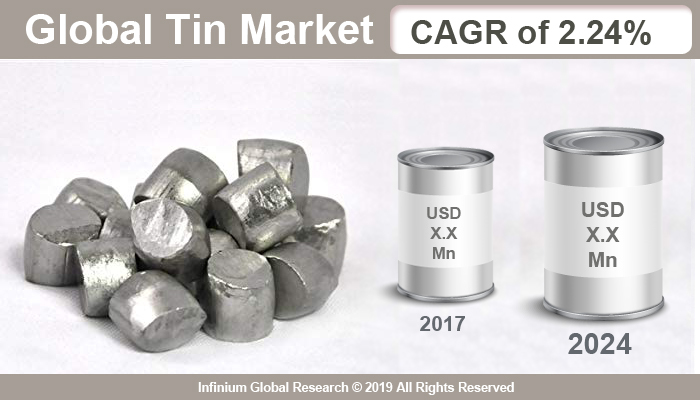 A recent report published by Infinium Global Research on the tin market provides an in-depth analysis of segments and sub-segments in the global as well as a regional tin market. The study also highlights the impact of drivers, restraints, and macro indicators on the global and regional tin market over the short term as well as long term. The report is a comprehensive presentation of trends, forecast and dollar values of the global tin market. According to the report, the global tin market is projected to grow at a CAGR of 2.24% over the forecast period of 2018-2024. Tin is a soft, malleable, ductile and crystalline silvery-white metal. Being so soft, tin is rarely used as a pure metal instead it is combined with other metals in order to make alloys that possess tin's numerous beneficial properties. These include a low toxicity level and a high resistance to corrosion. Tin is also both malleable and ductile. Tin acts as a catalyst when oxygen is in solution and helps to accelerate the chemical reaction. The growing use of tin in the electronics industry in various products such as a computer, mobile, tablets, and another consumer electronic device drives the demand of the tin market. Soldering is one of the potential end-user applications in the electronics industry and tin is an essential constituent in soldering. Tin and tin alloys such as tin-copper, tin-silver, tin-lead, etc. are used extensively for solder applications. Nowadays, lead-free solder mostly uses tin as the base material. Due to government regulations and growing environmental concerns, various industries are opting for lead-free solder, thus promoting the growth of the tin market. Electro-plating is another important application of tin. It is primarily done for providing corrosion resistance to a wide range of products. Tin is generally applied over a preliminary coating of steel, copper, and aluminum due to its several characteristics. They are malleable, durable, good tensile strength, non-toxic, lightweight high solderability, electric resistors and dielectric ductile and resistance to corrosion. Additionally, tin compounds and tin dioxide are widely used in used electric resistors and dielectrics and tin monoxide that it is used in the production of tin salts for electroplating and as chemical reagents. However, the availability of substitutes may hamper the growth of the tin market. Going further, the rising shift towards recycling to tin is expected to create significant growth opportunities for the tin market. Moreover, increasing awareness related to use of tin-aluminum alloy in lithium-ion batteries to double the charging capacity. This, in turn, provides immense growth opportunities for the tin market during the forecast period. Geographically, Asia Pacific holds the maximum market share in the global tin market and is expected to remain dominant over the forecast period. The expansion of electronic industry and automotive industry promotes the Asia Pacific tin market. Improved economic conditions and high disposable incomes of the rising middle-income Asian countries are contributing to the growth of the electronic and automotive industry market, which in turn drives the tin market. Moreover, the presence of a major tin producer in China and India increases the growth opportunity in this region. In addition, the growing demand for steel owing to the substantial growth in infrastructural development in the Asia-Pacific region favors the growth of the tin market in this region. North America holds a significant share in the tin market after the Asia Pacific owing to the high demand for electronic devices and the favorable environmental regulations in this region. The report on the global tin market covers segments such as product type, application, and end-user industry. On the basis of product type, the sub-markets include metal, alloys, and compounds. On the basis of application, the sub-markets include tin plating, chemicals, solder, specialized alloys, lead-acid batteries, and chemicals. On the basis of end-user industry, the sub-markets include electronics, automotive, packaging, glass, and others. The report provides profiles of the companies in the market such as Metallo Chimique international NV, Minsur S.A., YUNNAN TIN COMPANY GROUP LIMITED, Yunnan Chengfeng Nonferrous Metals Co., Ltd., PT TIMAH Tbk., DuPont and Do, ArcelorMittal, Indium Corporation. The report provides deep insights into the demand forecasts, market trends, and micro and macro indicators. In addition, this report provides insights into the factors that are driving and restraining the growth in this market. Moreover, The IGR-Growth Matrix analysis given in the report brings an insight into the investment areas that existing or new market players can consider. The report provides insights into the market using analytical tools such as Porter's five forces analysis and DRO analysis of the tin market. Moreover, the study highlights current market trends and provides forecast from 2018-2024. We also have highlighted future trends in the market that will affect the demand during the forecast period. Moreover, the competitive analysis given in each regional market brings an insight into the market share of the leading players.